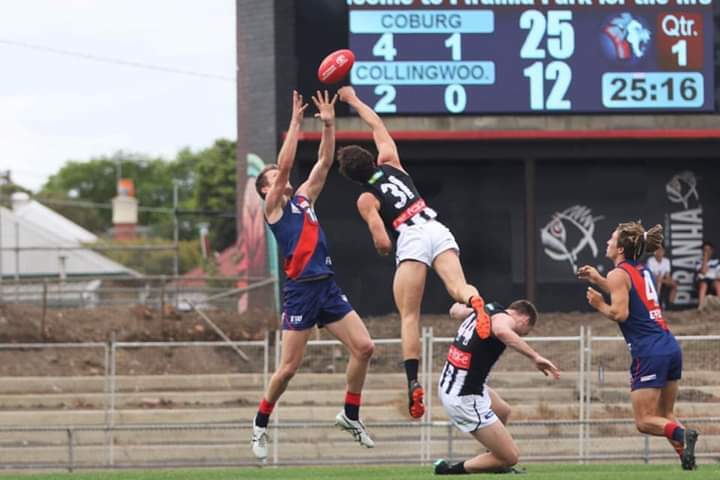 2019 has gotten off to a tough start for Coburg, suffering a three-point loss at the hands of Collingwood. The Lions were up against a strong Collingwood team with 12 AFL listed players playing but the Lions’ pressure and ball use kept them in the game all day. Coburg were all over the Pies early, having the first 10 inside 50’s as the ball spent majority of the first quarter locked in the Lions forward half. Co-captain Peter McEvoy had a dream start to his season kicking two early goals in the first quarter to immediately put the scoreboard pressure on. Brodie Foster and Braedyn Gillard both found plenty of the ball early, while fellow debutant Jonty Neaves didn’t take long to kick his first goal in Coburg colours. After a six goal to three opening quarter, Coburg had all of the momentum going into the second term but that quickly changed. The pressure that had been key to its first quarter dominance dropped off which allowed Collingwood to move the ball freely and transition from defence to attack with ease. The Pies kicked four goals to nothing for the quarter as the Lions run vanished and the quality of their ball movement significantly dropped. Trailing by seven points at half time, there was plenty of work to be done in the second half. Coburg started the third quarter kicking to what was the scoring end in the first half and it was able to steal back the momentum early after some slick ball movement lead to a Sam Lowson mark inside 50. He made no mistake from the set shot, tieing scores in the process. The Lions began to win more of the ball at ground level which allowed the likes of Lochie Dickson and Jesse Corigliano to run and carry the ball and showcase their skills. After a big drop off in the second term, the pressure around the ball was right back up again which forced continuous turnovers and gave Coburg plenty of scoring opportunities. Billy Cannolo and Jack Murphy both got on the goalkickers list as the small forwards were rewarded for their hard work and pressure. Dickson kicked his second for the game late in the third quarter to extend the margin to three goals at the final break. With the game on the line with just a quarter to play, the Magpies came out all guns blazing and kicked the first three goals of the quarter to take the lead back. Coburg worked hard until the final siren, but the experience and fitness of Collingwood became a big factor. The ball was locked in the Magpies forward half for most of the last quarter and Coburg was met with Magpies players time and time again as it attempted to clear thanks to the Pies setting up well behind the ball. The ball was locked inside Coburg’s fifty for the final minute of the game with a couple of repeat stoppages before the final siren just beat the Lions, resulting in a three-point loss. Speaking post game, coach Leigh Adams said the boys were disappointed with the result. “They’re pretty shattered, it was obviously a game where we were in a position to win but as I just said to the boys, 90% of the stuff was really good but there was just a little bit of stuff we’ve got to adjust, fix up and learn from but for most of the day I couldn’t have been prouder of the boys,” Adams said. While the result was disappointing, Adams was pleased with the pressure applied and saw a big difference compared to last season.